Microsoft OST to PST Conversion Program has advanced technique to analyze corrupt Offline Storage file and save to OST data and convert OST into PST, MSG and EML. 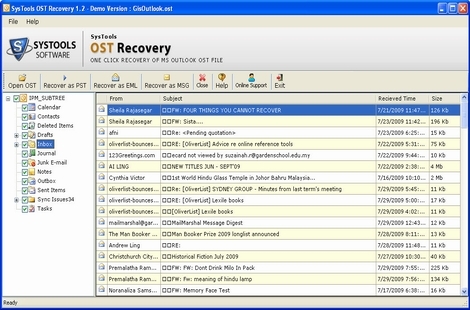 Microsoft OST to PST software supports Microsoft OST to PST conversion for OST files created using Microsoft Exchange 5.0, 5.5, 2000, 2003, 2007 and 2010(32 bit) version. ...... We understand that the email database is very essential for IT admisntrator or Outlook user so if Exchange database is corrupts then OST file store in Exchange database if you want to resort important OST file from exchange server then use this software. You don't need any technical knowledge to our software because our tool done this conversion with few click. Microsoft OST to PST Software successfully runs on any windows Win-7, Vista, XP, NT, ME, 2003, 2000, and 97.If you want to try our software, then you can download the Demo version of convert Microsoft OST to PST software which is available on the website. If you want to purchase this software pay only $99 for the personal license and $199 for business license. Qweas is providing links to Microsoft OST to PST 3.2 as a courtesy, and makes no representations regarding Microsoft OST to PST or any other applications or any information related thereto. Any questions, complaints or claims regarding this application Microsoft OST to PST 3.2 must be directed to the appropriate software vendor. You may click the publisher link of Microsoft OST to PST on the top of this page to get more details about the vendor.